how to pickup color plette? I did pick up color palette, but two color line in palette, and is not match my brush color. how could pickup gradation color? Re: how to pickup color plette? For the record, I've already replied you in your other communication. 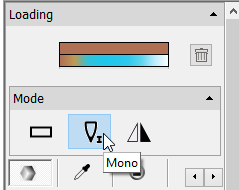 You are unable to get a gradient probably because you have 'Mono' toggle ON.